One of the objectives of using a live chat solution for support is to encourage visitor engagement. Proactive chat lets you do just that. You can use Conversion Support’s proactive chat feature to automatically pop up within a specified number of seconds. Proactive chat lets you initiate a live chat session from your end, without requiring the visitor to click on the Live chat button or link that is embedded within your website. 3. On the “Settings” page, click on “Lead capture”. 5. In the “Seconds to Launch” window, enter the number of seconds after which you want proactive chat to pop up. 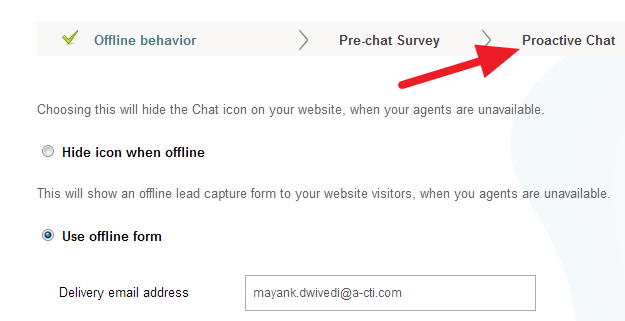 For example, if you enter 25 in the “Seconds to launch” window, proactive chat will pop up in visitors browser after he has spent 25 seconds on your website. Don’t want to use Proactive chat at all? Set the value of “Seconds to Launch” field as 0 and you are done. 1. Proactive chat is an optional feature and not an integral part of Conversion Support. You can choose to use Proactive chat or choose not to use it, it entirely depends on your needs and requirements. 2. Proactive chat is useful when you want your agents to initiate a chat conversation. However, note that in some scenarios, proactive chat can be a major distraction (e.g payment pages, sign-ups). It is recommended to use Proactive chat wisely.